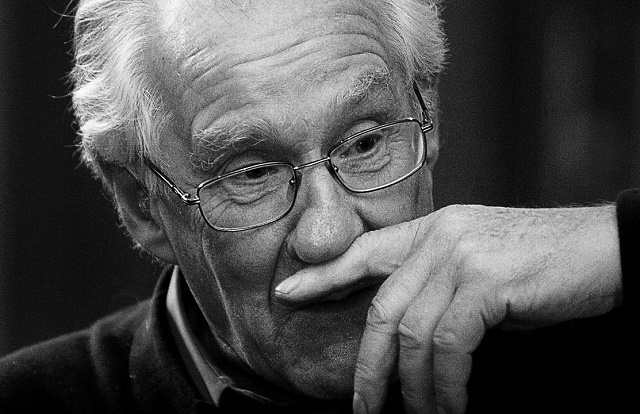 In the second installment of his ten-part series on Badiou, Andrew Robinson explains the specific claims of Badiou's philosophy: the necessity of a transcendent “one” for social order, the appeal to mathematical set theory, and the rejection of qualitative or “substantial” references in philosophy. In the previous column, I examined Badiou’s conceptions of ontology and science. Here, I explain the specific claims of Badiou’s philosophy: the necessity of a transcendent “one” for social order, the appeal to mathematical set theory, and the rejection of qualitative or “substantial” references in philosophy. Badiou is also opposed to ‘transcendence’ and ‘the One’. These are Badiou’s terms for what is termed the ‘trunk’ (arborescence) in Deleuze, the ‘master-signifier’ in Lacan or ‘sovereignty’ in Agamben. Transcendence occurs when a concept integrates the social or linguistic field by subordinating everything to itself. ‘The One’, or trunk, provides a foundation for everything else that exists. Reality is thought to be solidly rooted in such a One. Hence, God is the transcendent One for religious believers, the state is the transcendent One for statist authoritarians, the nation is the transcendent One for nationalists, and labour (or humanity’s productive essence) is the transcendent One for Marx. Badiou controversially claims that every theory with a substantive reference is necessarily ‘transcendentalist’ (i.e. It has a transcendent One). He argues that a lot of theorists who would not generally be called ‘transcendentalist’ – such as Deleuze, Bergson, Spinoza, and Negri – are actually covertly transcendentalist, because they have a substantive reference. On the other hand, Badiou thinks that his own set-theoretical multiplicities avoid transcendence. They can do this because they do not have any external limit. In other words, there is no rule which says the multiplicity can’t be expanded. Set theory also means that the set does not necessarily ‘consist’ (or cohere). This argument is slightly confusing, because Badiou does maintain that every situation has a One, or rather, a ‘count-for-one’. A ‘count-for-one’ is a contingent gesture which defines a particular One and gives the rest of reality coherence. However, Badiou denies that this makes him a transcendentalist, because he recognises the contingency of any particular ‘count-for-one’. Every “one” is actually an effect of a “counting-for-one”, a procedure which decides (for reasons which are mathematically more-or-less arbitrary) to treat certain entities as “ones”. The “count-for-one” is a kind of sovereign gesture or practice in a situation. A social example would be the “decision” to count all commodities as having exchangeable values in terms of money. According to Badiou, there are no units prior to the count. Strictly speaking, there is “nothing” prior to the count. However, this “nothing” has a particular existence as “inconsistent multiplicity”. This approach is similar to standard types of social constructivism which claim that existence is created by linguistic categorisation. It differs mainly in that mathematics, rather than language, is taken to be the medium of social construction. Most of Badiou’s theory (with the partial exception of his theory of the Event) is based on set theory. Set theory is a particular type of advanced maths, mostly concerned with the abstract properties of sets (i.e. independently of the nature of their constituent elements). Set theorists have deduced that it’s possible to say some things about sets and their elements even when they cannot be counted. As such, set theory often deals with sets that cannot be counted, and shows, for instance, that it is often possible to say something about the relative size of sets, even when one can’t say anything about the exact number of elements in either set. There’s no need to count or name the elements in a set to be able to say things about the set. For instance, it’s possible to say there are more silver cars than pink cars on the road, without counting exactly how many of either there are. It’s also possible to say that the number of possible relationships among units in the set is greater than the number of units, without knowing how many units there are. And it’s possible to say that no set is the set of everything, since the set of relations within a set would be bigger still. Set theory often deals with numbers which are either infinite or infinitesimal. For instance, there are numbers – such as the square root of 2 – which can’t be accurately expressed as an integer (some, such as the square root of minus one, are called ‘irrational numbers’). Moreover, there are infinitely small numbers, commonly encountered in calculus, for instance. when calculating the length of a curve as a series of infinitely small lines. Then there’s the different intervals and fractions into which a line can be divided. Because some of these intervals are non integer values, these parts of a line can’t be ‘counted’ in the common sense meaning of the word. In this regard, set theory, like other branches of abstract or pure mathematics, allows for conceptual abstractions that are far removed from, and autonomous of, the physical everyday world. According to Badiou, what “is”, or exists, however, ultimately eludes even the possibilities of set theory. The latter is “inconsistently multiple” and thus cannot be presented as a set. However, anything which can be presented, must be presented as part of a set. Set theory is a way to present inconsistent multiplicity in a consistent way. One conclusion of set theory, in Badiou’s conception of it, is that any set can be expanded into a larger one. There is no ‘set of all sets’. And in relation to any set, a bigger set could always be constructed. Set theorists talk about this in terms of ‘forcing’. In set theory, to ‘force’ a set is to make a new set the different possible relations among the parts of an initial set. The second, ‘forced’ set is always larger than the initial set. And it always includes an empty set which includes none of the parts, as one of the possible ways the parts might relate. Sets in set theory are always ‘consistent’, meaning that they can be treated mathematically. They are distinct from an ‘inconsistent’ or absolute infinity or multiplicity, which cannot be treated mathematically, or collected into a set. The set of all sets would be an inconsistent multiplicity. The set-theoretical response to this problem is to shut out consideration of anything inconsistent. In order to preserve the consistency of set theory, this theory explicitly bars its own limits from consideration. The process of ‘axiomatisation’ – the stipulation of a series of axioms – was for Badiou a way to ensure the consistency of set theory. For Badiou, set theory refuses to define what a set is – a refusal which generally leads to its rejection by ontological theorists. It also does not provide any explanation for why things should be treated as sets. Set theory effectively prescribes, rather than describes, a reality it constructs from first principles. This is part of what makes it attractive to Badiou. Set theory deploys a restrictive approach to keep itself consistent. By defining something as a set, one effectively says that one knows and wants to know no more than set theory can figure out from its postulates. In applying his conception of set theory to politics and ontology, Badiou effectively takes such a stance. He treats political phenomena as potentially consistent, countable sets. For Badiou, there is no test of correspondence to reality in set theory. It operates as a self-referential system. Claims within set theory are true if they follow from previous claims within set theory. An axiom is always something artificial and invented. It is accepted based on its usefulness and its fit with other axioms. In practice, a lot of sets are defined by particular concepts. Someone might count the number of cups in a room, or citizens in a country, based on a definition of a cup or a citizen. In set theory, however, sets are assumed not to be defined in this way. Instead, a set is simply a combination of elements. This is known as “extensional” definition of a set. In set theory, any collection of objects can be thought of as a set. Badiou’s use of set theory is unusual, because set theory generally isn’t used much outside of formal mathematics. Set theorists do not claim that their branch of mathematics can operate as ontology. In fact, they usually don’t even use set theory in relation to concrete, real-world sets. When mathematics is applied – even in the physical sciences, let alone the social sciences – it is usually applied in the context of definite, actual numbers (‘values’). Badiou is therefore a long way from the standard uses of set theory in claiming it can be applied to politics. Badiou thinks of social and political relations as a mathematical multiplicity or set. This means that the social world can be theorised without empirical analysis. On its own terms, Badiou’s theory relies on nothing outside itself. It is internally consistent and intact. Its criteria are entirely internal to it. One of the central aspects of this kind of mathematical vision is the removal of ‘substantive’ references. Set theory is a type of theory which applies to all the elements of a set, but does not specify what these elements are. It is their formal nature as units within a set which is the object of theory. Badiou treats social and political relations in the same way. It is the formal nature of social forces as parts of (or not parts of) particular sets which is politically important. Badiou also assumes that sociopolitical sets are of a special type. There are natural sets or situations (or ‘tonal worlds’ in the language of Logic of Worlds), in which multiplicities fill the universe without remainder. They are founded on a countable series of integers (e.g. 1, 2, 3 etc). These types occur throughout the natural sciences, and explain for Badiou why set theory is not much needed in astronomy, biology, chemistry and so on. These sets do not have an excluded part or Evental site. There is a second type of set – known as a historical set (or an ‘atonal world’) – in which it is simply decided as an axiom that the infinite exists, and which are therefore haunted by a remainder. This kind of set is cut off from any objective reality outside it, and is ‘decided’ simply by its axioms. These sets arise in situations which cannot be reduced to integers. They might not strictly speaking be grounded on a mathematical zero. But they are “non-ontological”, because they lack foundational stability. Badiou calls these historical situations. He insists that sociopolitical sets are historical rather than natural sets. Badiou adopts the standard extensional view of sets which is used in set theory. In ontological terms, this is taken to mean that the multiplicity is ‘founded on nothing’, and that it is properly ‘absolute’. It is founded on nothing because it does not rely on a substantive reference. The excluded part, or empty set, is not even permissible in Badiou’s conception of set theory. It is ruled out by the Axiom of Foundation. This means that, for Badiou, mathematics cannot say anything about Events, Truths, or truth-procedures, though he concedes that mathematics can show the ontological form which arises from Events and truth-procedures. Historical situations are always haunted by infinity. The concept of ‘infinity’ in set theory is not the same as the standard use. An infinite set is a set which is so large that it can’t be counted – an indefinitely large set. Badiou uses this type of infinity in his analysis of social situations. He argues that there is always an excess of ‘parts’ over ‘elements’ in a situation. In other words, every situation contains something which is excluded. This assumption is ultimately conservative (exclusion is unavoidable), but Badiou uses it for progressive purposes. He sees ‘Events’ and revolutions arising from the excluded part. Badiou’s concept of infinity identifies the ‘banal be-ing of all being’ with inconsistent multiplicity. This contrasts Badiou’s concept of the infinite to its usual transcendental or ineffable implications. Badiou here contradicts set theorists such as Cantor and Adrian Moore, who, for him, see infinity as an unknowable field beyond being. For Badiou, the ineffable, unknowable infinite does not exist. There is no “beyond” in which we could find becoming, plenitude, creativity, or Zen-like existence. There is only mathematical infinity. In other words, there is no infinity of a type which defies philosophical exposition. Only inconsistent multiplicity exists. Infinite multiplicity is unpresentable. It provides the substance of all being. This type of infinity cannot be known ontologically either, but it can be grasped subjectively. This is important for Badiou’s concept of Truth and the Event. Ultimately, this foundational level is negative. He follows the Lacanian view that reality is founded on a void or gap. He sees inconsistent multiplicity as a void rather than a force of becoming. This underlying void is “one”, because no void can be distinguished from another. No two voids have different elements that would differentiate them. Hence, Badiou is a theorist of constitutive negativity. This means that relations (the fact that different things are related to each other) cannot be foundational. The void, which we cannot relate to, is more fundamental than any relations we are in. This conception suggests that Badiou thinks that what the world is for mathematics is what is actually is. The underlying level of inconsistent multiplicity is simply what it is for mathematics – an unrepresentable void. It is not a substantive reality that mathematics is unable to represent. In the social sciences, the desire to model and to reduce things to mathematical representations is suspect among radicals. The reason for this is that quantitative (number-based) social science tends to be used in conformist ways. It counts people from outside, without looking at their experiences or beliefs. Badiou might be suspect on these grounds. However, he does not seem to be aligned with quantitative social science. For instance, he is strongly hostile to the kinds of category-based statements which quantitative social science uses. His objection seems to be twofold. Firstly, quantitative social scientists mistake a historical situation (which is ultimately unknowable) for a natural situation (with countable parts). Secondly, the focus on countable particularities conceals the possibility of newness, and therefore aids the maintenance of discursive order. This said, he repeats quantitative social scientists’ mistake of ignoring the qualitative specificity of social life. One consequence of adopting a conception of set theory as a model, is that it renders what something is made of irrelevant. Instead, for Badiou, different elements (or things) are different only in that they belong to different sets (or subsets of sets). Things can be reduced to their relations, while their nature and attributes are theoretically unimportant. Such “substantial” realities may exist, but they have no consequence for theory. This analytical abstraction makes sense in formal set theory, as it allows us to talk about sets without knowing anything about their elements. In fact, Badiou goes as far as to argue that the unity or identity of an element is actually an effect of the set to which it belongs. As well as substance being irrelevant, the relation among elements within a set is irrelevant in the set-theoretic terms proposed by Badiou. Perception and objects are also taken as irrelevant. Socially and politically, its effects are controversial. To think about the significance of this approach, consider a list like that of Borges’ Celestial Emporium. From a Badiousian perspective, the fact that all these elements belong to the same set renders them equivalent. They have the same significance because they are members of the set. So politically, one wouldn’t be able to distinguish among the elements based on anything outside the set itself. As we will see, Badiou does let us argue about certain elements being left out of a set (the exclusion of workers, women, migrants and so on). But this seems to relate only to items excluded from a set – not to items wrongly included or wrongly positioned within a set. As Hallward argues, Badiou does not recognise constraints (social, cultural, psychological, biological) on how people can be grouped into sets. And he does not recognise that human characteristics give any reason to group people in one way rather than another. It is not only the apparently qualitative aspects of life which resist Badiou’s approach. Fields such as biology, chemistry and so on are often considered not to be reducible to set theory – even at their most basic level. In fact, according to Gödel, a consistent and comprehensive axiomatic system is impossible. Badiou, in contrast, argues that all sets can be treated in terms of set theory. Badiou’s theory is open to the objection that politics often involves what set theory brackets out. Politics is all about the substantial characteristics of social actors, the relations among them, and so on. Badiou rejects the political significance of what he terms ‘substantial’ characteristics. This term encompasses a range of possible political positions. For instance, identity-politics based on a particular, essentialised identity, would be using a ‘substantial’ reference to an identity, as would a class struggle politics based on a specified model of class. So would a reactionary reference to a nation or class. A lot of other things would also be covered as substantial. Forms of life, existing beliefs, hidden transcripts, “good sense”, indigenous communities, specific anti-capitalist models, religious beliefs, desires, interests, needs, are all substantial references. Even a subject-position or a place in the current social order, if it isn’t thought about abstractly enough, is a substantive reference. In other words, Badiou rejects an awful lot of varieties of progressive politics – from post-left anarchy to struggles for reforms, and from radical feminism to trade unionism. Badiou’s particular quarrel seems to be with a model of politics in which people appeal to the qualitative as a counterpoint to the existing quantitative order. A lot of radical theories – arguably most radical theories, at least from the 60s onwards – appeal to the qualitative as a counterpoint to a social order built on commodification and instrumental rationality. For instance, they might refer to the living use of spaces against their commodification (Lefebvre), or to autonomous subaltern views of the world (James Scott), or to desires which resist capture by the system (Deleuze), or to use-value as a counterpoint to exchange-value (Marx). Badiou thinks this kind of approach is always wrong, arguing this kind of approach remains within the existing system’s way of thinking. It cannot escape the existing ontology, because it refers to items which can be defined in the system’s own terms. And it reinstalls a transcendent One, because it appeals to a criterion outside mathematics. Badiou is sometimes criticised for a theory which seems to have no relationship to the world or reality. Badiousians respond that this objection is based on a flawed view of ‘truth as adequation’. However, the neglect of the qualitative in Badiou’s theory is clearly a deliberate subtraction. One does not have to believe in a realist model of truth to argue that the elimination of qualitative and particular aspects of situations renders a theory less valid or useful than it might have been. Any theory which suggests that there is an extra-mathematical reality of any kind, and that this reality can be experienced as anything other than a void, will repeat the criticism that Badiou removes the world. Badiou’s approach seems to deny affect, embodiment and meaning. As living beings, people are always part of particular relations, bodies, experiences and so on. To focus exclusively on our position relative to ontology and the Event seems remarkably like sacrificing ourselves for an abstraction – a Stirnerian spook or a Situationist ’cause’. This is a bit unfair to Badiou. We aren’t meant to subordinate ourselves to an Event in a dogmatic way – we’re meant to be carried along by it. But still, the claim that we need to follow the infinite, historical, ‘truly human’ part of our nature at the expense of the merely ‘animal’ parts suggests that such a concern is not entirely without merit. To read other articles in this series, please visit the In Theory page. A kind of ecstasy radiates in this Absolute which is not just what everything is superimposed but also all possible anything past or future is superimposed – and also exists nothing or the empty set. Important is what this means for the common misconception of the transcendental as beyond “what is”. Test this new apps blog for children, Available downloads for iPhone, iPad, Kindle, Nook, and all Adroid phones and tablets.